Today I'm finding some light-hearted charitable inspiration in one of my favorite television shows, Arrested Development. I don’t know about you, but nothing sums up the way I’ve been dragging myself through this short, post-holiday work week better than this George Michael gif. 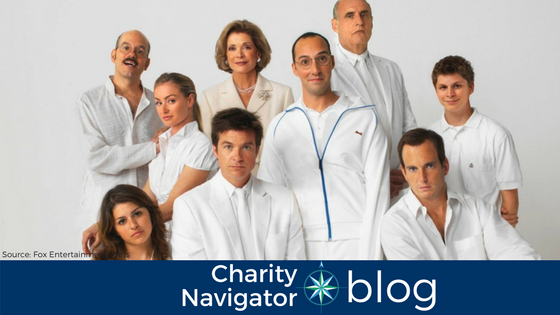 Always looking for a inspiration to think about and relate charitable giving in a new way, I landed on Arrested Development. Fans of the show will know that the Bluths, a caricature of a dysfunctional family, are incredibly self-involved and can hardly be imagined as remotely philanthropic. The over-the-top story line and their silly antics, however, provide wonderful charitable inspiration. Throughout the series the Bluth Company, the family’s real estate development firm, is entangled in scandal from building faulty homes, to laundering money for the family’s personal expenses and side businesses, and bankruptcy. Luckily, there are organizations committed to providing individuals with safe, fair housing and healthy communities. Beyond Housing exists because home matters. We began with actual houses and housing preservation, focusing on quality and stability to give people a place to start. But, there is more to a home than the house. Home is about the life that happens in and around the house as well as the life that fuels and draws out the best of the people within it. Beyond Housing is a community development organization that works in defined geographies like the Normandy School District in order to focus our resources where we can have the greatest impact. While most organizations focus on one, maybe two, impact areas within a community, we understand that, in order to have real impact, we must focus on all of the areas that make up a thriving community-housing, education, health, economic development and job readiness/access. CHN Housing Partners is the nation's largest nonprofit, single-family affordable housing developer. Our mission is to build strong families and vibrant neighborhoods through quality affordable housing and strengthened financial stability. We work toward this mission through affordable housing and home ownership programs; training and education; energy conservation; and safety nets and supports. Each year, we serve 30,000-50,000 low- and moderate-income families to help achieve financial stability and economic self-sufficiency. In one episode fans are introduced to the Cornballer, one of the father’s failed early inventions. The device was used to make corn balls but was taken off the market after it was found to cause serious burns. Organizations like the National Consumer Law Center exist to provide consumer protections to America’s most vulnerable populations. The National Consumer Law Center (NCLC) is the nation's consumer law expert, helping consumers, their advocates, and public policy makers use powerful and complex consumer laws on behalf of low-income and vulnerable Americans seeking economic justice. In addition to disadvantaged consumers everywhere, we devote special attention to the problems of immigrants, vulnerable elders, homeowners, former welfare recipients, victims of domestic violence, military personnel, and others. NCLC also provides support on issues involving consumer fraud, debt collection, consumer finance, energy assistance programs, predatory lending, and sustainable home ownership programs. Believing his brother is patronizing him with meaningless work, Gob Bluth throws a letter he was asked to mail into the ocean. Throwing the letter into the blowing wind and rushing ocean was much harder than it looked and sent Gob tumbling into the waves over and over until he finally succeeded. Imagine if that beach and ocean were dirty… gross! Luckily for Gob, there are a number of organizations committed to protecting our beaches and oceans -- keeping them clean and healthy to ensure we can enjoy them for years to come. Founded in 2001, The Ocean Foundation (TOF) is a unique community foundation with a mission to support, strengthen, and promote those organizations dedicated to reversing the trend of destruction of ocean environments around the world. They work with a community of donors who care about the coasts and oceans. In this manner, they grow the financial resources available to support marine conservation in order to promote healthy ocean ecosystems and benefit the human communities that depend on them. TOF increases the capacity of conservation organizations, hosts projects and funds, and supports those working to improve the health of ocean species globally. Founded in 2001, Oceana is the largest international group focused solely on ocean conservation. Our offices in North America, South America and Europe, work together on a limited number of strategic, directed campaigns to achieve measurable outcomes that will help return our oceans to former levels of abundance. 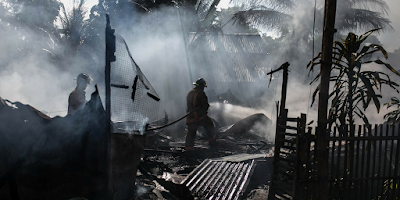 We believe in the importance of science in identifying problems and solutions. Our scientists lead our team of economists, lawyers, and advocates focused on achieving tangible results for the oceans. Saving the oceans may take decades, but in each of our campaigns we aim to accomplish an important milestone in that effort within two to five years. So there you have it -- a little charitable inspiration taken from Arrested Development, a most unlikely source. Where do you find your inspiration and commitment to philanthropy? Comment below to let us know. And, from the team at Charity Navigator, Happy Friday!